In complete honesty, the hardest part of figuring out “optimal” economic policy for the moment is deciding how to gradually begin diminishing the budget deficit without losing so much government supplied economic stimulus that GDP starts rolling over. Exactly how to do that and how fast really is an important question. 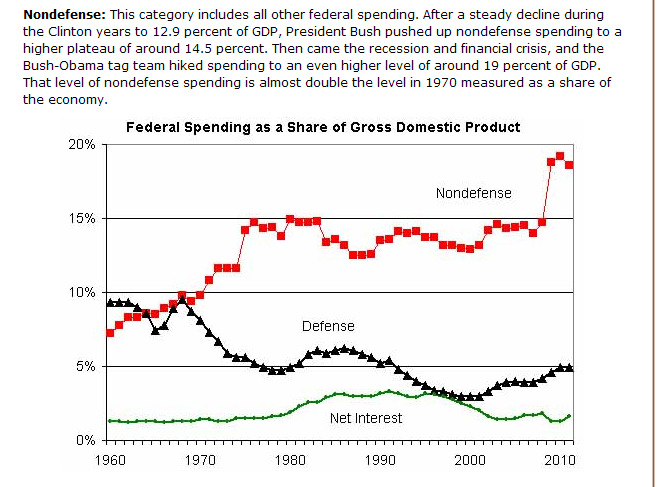 Since 1976, the discretionary part of Federal spending hasn’t gone over 15% of GDP. Between the cost of the massive financial/housing bailout and the already rising costs of Medicare & Social Security & retiring baby boomer demographics, that number is headed to 20% of GDP and destined to be pegged there for decades before the healthcare bill passes. IMHO, that’s why the tea party has been out in the streets protesting and why the healthcare bill is such a bad idea. 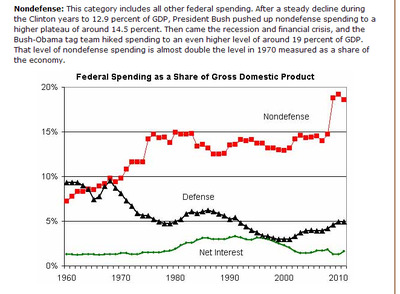 Without the healthcare bill, Federal spending is heading to 20% plus of GDP and raising taxes to close the deficit will just immortalise that ugly level in bureaucratic cement. And Obama is right about rising Medicare [he leaves out Social Security] costs clobbering the budget going forward. It’s almost impossible to intelligently control Medicare and Social Security costs anyway in the face of the demographic bubble of baby boomer retirement, if that’s what the politicians in charge are trying to do, and in the case of Obama and Pelosi and Reid, that’s just NOT what they’re trying to do, in truth. Now, put higher taxes today into the mix PLUS much higher Federal spending on healthcare overall in 2015-onward into the mixture and the chart above probably goes to 25% or more Federal Government control of GDP for the rest of our lifetimes (and that’s if we’re lucky and don’t have to fight a major war with anybody anywhere in the next 40 years . . . . . ).